Being able to access the internet on a computer is something that’s important to a lot of people living in vans and other unconventional types of homes. While most of us could do with less connectivity, it’s necessary for some people for things like work and school (and let’s be honest - Netflix for some of us), but can be a hassle having to visit a coffee shop or library every time you need or want to get online on your computer. When we moved into our van we knew we wanted internet access and explored a variety of options including changing phone plans to something with unlimited data that allowed tethering or some sort of mobile hotspot. For the first few months in the van we tried a prepaid Verizon Mifi hotspot with unlimited 3G we got off of eBay. It seemed to work well at first, but we quickly discovered that it was very unreliable and could only pick up a strong enough signal in very specific spots, so it was back to the drawing board. Eventually, we settled on the WifiRanger Sky Pro. Who And What Is A WiFiRanger? WifiRanger is a company that creates internet solutions specifically for RVers. Their products enhance existing internet sources by increasing the strength of weak WiFi signals from up to two miles away depending on the model. In other words, it allows you to boost and connect to public WiFi from places like libraries. Their products are also created to be roof mounted to overcome line of sight issues and as such are constructed with heavy duty waterproof casings, UV resistant materials, and flexible break resistant antennas. One of the things that really sold us on WiFiRanger were the security features, because normally you really don’t want to use public WiFi for things like banking. 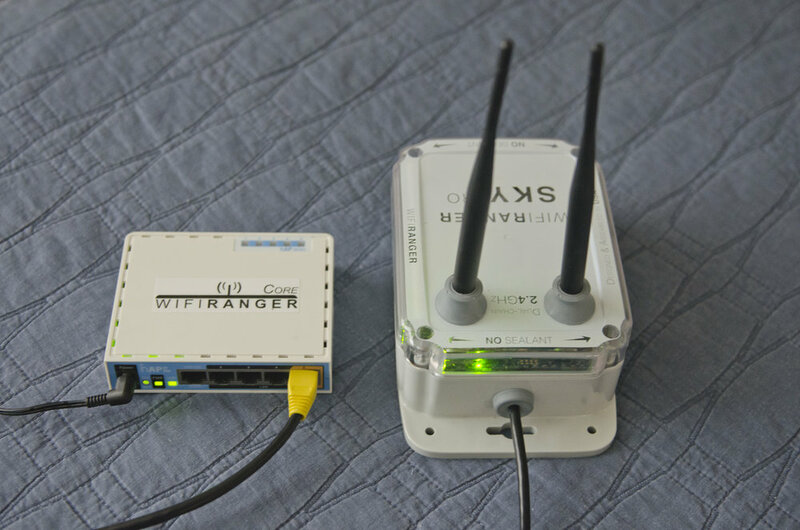 However, WiFiRanger products allow you to create your own secure WPA2 encryption network with a firewall that you connect to each time you get online, enabling you to safely use public WiFi for personal matters. In our experience, very well. We’ve had our WiFiRanger Sky Pro for over a year now without any issues and have used it for everything from Netflix to Skype. As you probably noticed from the above photo, we haven’t actually gotten around to mounting it on the roof of our van. When we want to use it we just put it in the window or on the dash and are almost always able to connect as long as we’re within range (1.5 miles for the Sky Pro) of a public network. If it already works that well, think about how well it’s going to work when we actually put it on the roof! When we were living in the parking lot of the hospital we worked at, we could always connect to the hospital’s guest WiFi, which was awesome as it was pretty fast and very reliable. That brings up a good point though: WiFiRanger products don’t make slow or glitchy internet better, they just increase the strength of the signal so you can actually connect to it. So, if you’re parked outside a friend’s house and they only pay for bare bones internet, that’s all you’re getting too when you connect to it. When you purchase a product from WiFiRanger, it comes with easy to follow instructions that guide you through setting up your WPA2 encrypted network. 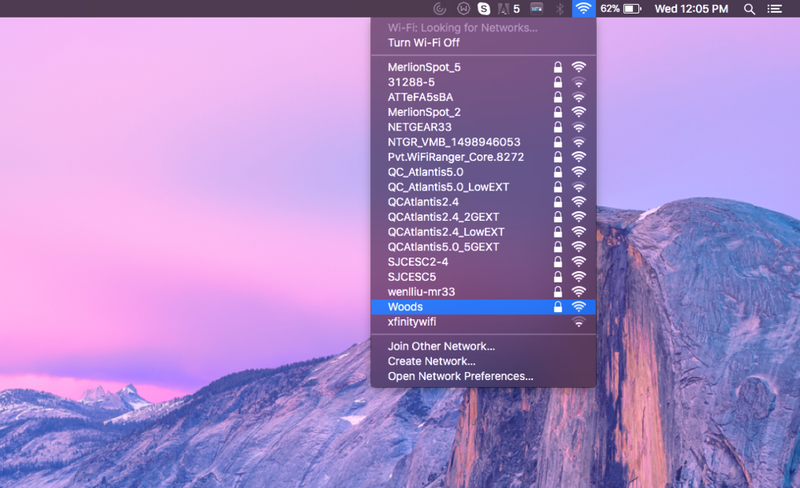 Once you’ve set that up and your WiFiRanger is turned on, your network will show up with all the other networks your computer is detecting when you open your WiFi options. In the example below, “Woods” is our private password protected network that only shows up when our WiFiRanger is on. In summary, there are a number of options out there for people who need internet in their van, RV, or other unconventional home. WiFiRanger made the most sense to us since it was a one time investment versus paying each month for a mobile hotspot etc. It’s worked great and we’ve even found it useful in more conventional situations. For example, after I had hip surgery we moved out of the van into a studio for a few months. The building had WiFi that was free for tenants to use, but we could barely pick up a signal from our place. We decided to set up our WiFiRanger and voilá - the signal was boosted enough that we could connect. If you have any questions about our WiFiRanger or want to share other vanlife internet solutions, leave a comment or send us a message!